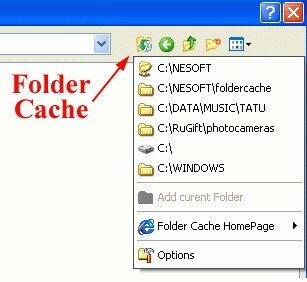 Folder Cache 2.6 free download. Folder Cache lists recently used folders in Open/Save dialog windows. It was designed for people who work with many files by seldom store and open them from the same directory. It places a button on Open/Save dialog windows which brings up a list of folders. With Chameleon Folder application you can open frequently used and favorite folders in Windows Explorer, Open/Save dialog boxes, archive extract windows, on the desktop, etc. QuickFolders adds its menus into the standard system menu of Open or Save File dialog. Waste lot of time while opening and saving files? Direct Folders will allow you access most recent and favorite folders directly from the standard File Open and File Save dialog boxes, as well as Explorer, WinZip and WinRAR. Folder Express allows you instantly jump to your frequently used folders in Windows Explorer, Open/Save File dialogs, folder windows or Browse Folder dialogs. Dialog Box Assistant greatly speeds up access to your data. Using PS Hot Folders special easily configured menu, you can quickly go to the folder that you want in standard Windows Open, Save As and Browse dialogs (Microsoft Office dialogs are supported too) or quickly open the folder that you need in Windows Explorer. Fast Folders is a shell enhancement which will give you rapid access to your most used folders in Common Open/Save dialogs, the desktop and in Explorer. Select Folder Express is the fastest solution you can access your files in the Windows Explorer.